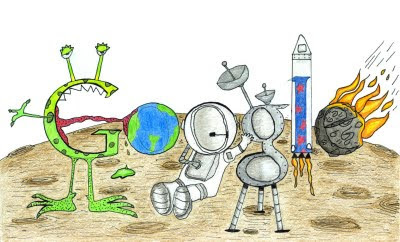 The Launch Pad: Doodle 4 Google Winner Loves Space! Doodle 4 Google Winner Loves Space! The Google Lunar X PRIZE would like to congratulate this year's Doodle 4 Google Winner, Matteo Lopez of San Francisco, California. After 5 million votes were casted, Matteo's drawing beat 107,000 other submission. We are thrilled to see that "space" is the theme for the 2011 Doodle, and it is exciting to know that Matteo wants to go to space and be an astronaut. Matteo has taken home a $15,000 college scholarship and $25,000 technology grant for his school.